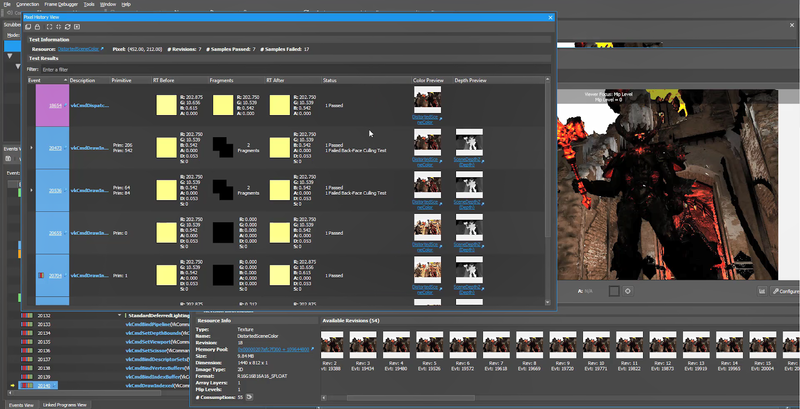 Today we’re announcing Nsight Graphics 2018.7. In this release, we enhanced our Ray Tracing support by adding the ability to view the scene Bounding Volume Hierarchy: the standardized acceleration structure in realtime ray tracing. We also greatly improved the ability to serialize C++ Captures of DirectX Raytracing (DXR) applications, increased Vulkan debugging capabilities with the addition of Vulkan Pixel History, and made assessing GPU activity easier in GPU Trace with a new GPU Busy indicator. For full details on the new capabilities in the 2018.7 release, see our full release notes! 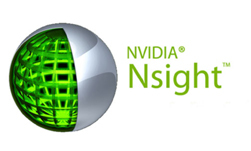 Ray Tracing Acceleration Structures can now be visually inspected in Nsight graphics through the Acceleration Structure viewer. This feature is supported on applications using DirectX Raytracing and Nvidia’s Vulkan Ray Tracing Extension. 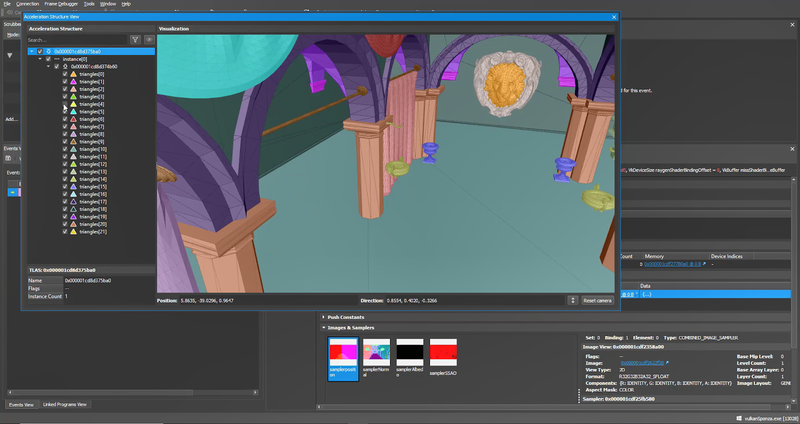 In this view, you can visualize the entire bounding volume hierarchy by freely navigating the camera around the structure, using colors to identify each BLAS, and focus the view by selectively rendering each piece of geometry. In the future, we’ll be enhancing this view to show additional information. Previously an experimental feature, we’ve further enhanced our Ray Tracing tools by fully supporting the ability to serialize DXR applications to a C++ capture. 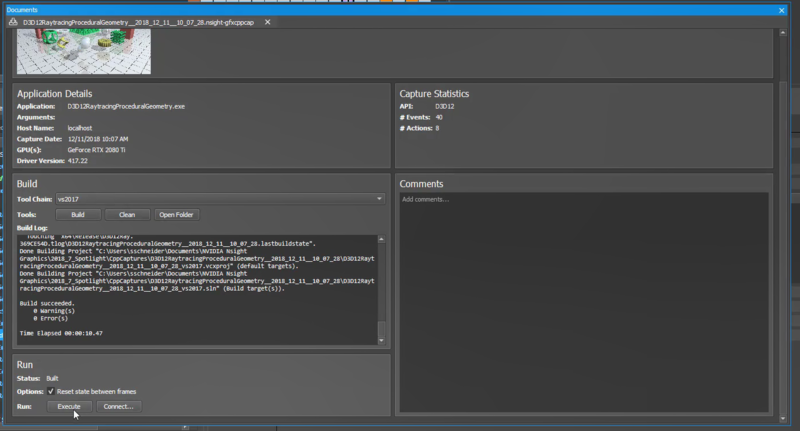 These captures enable a deterministic replay of your application, faster iterations by making quick modifications to C++ code, and the ability to share your capture with colleagues. Additionally, the Pixel History feature now support the Vulkan API. Pixel History is key to understanding how a particular pixel changed throughout the creation of a frame. This feature gives you the ability to inspect the pixel’s color at each revision, how many samples passed or failed, the failure reason if it failed, and the associated event. You can find out more information about Pixel History in this Pixel History Spotlight! GPU Trace has been updated with a faster way to help you determine how busy the GPU was for a selected region. This region could be a frame, perfmarker region, or a single event! We have also added support for two more NVAPIs: SMP Assist API (NVAPI) For VR Titles which enables users to profile VR Works applications and DirectX11 Meta-commands which allows users to profile applications utilizing DLSS technology. Finally, we have added support for another Vulkan Extension to the list: Vulkan Meshlets (VK_NV_mesh_shader)! You can now profile, debug, and create a C++ Capture of Vulkan applications that utilize mesh shaders and meshlets. A full list of supported Vulkan Extensions can be found in our documentation.